The Milwaukee Bucks built a 20-point lead against Cleveland, then saw the Cavaliers climb into the lead before rebounding for a 119-116 win on Tuesday night at the BMO Harris Bradley Center. With Lebron James on the sidelines, the Cleveland reserves went on a 24-2 run to turn a big deficit into a lead. The Bucks finally woke up to pull out the victory, ending a three-game losing streak and a five game losing skid against the Cavaliers. With the Bucks down by one, Tony Snell buried a three-pointer to put the Bucks up two with 58.9 seconds left. Cleveland then missed back-to-back threes by Lebron James and Kyle Korver. The Cavaliers then elected to defend the Bucks instead of foul and it almost worked. But Giannis Antetokounmpo beat Lebron James to a loose ball and hit a layup and was fouled with 5.9 seconds left. Giannis made the free throw to put the Bucks up by five. Lebron James, who led all scorers with 39 points, hit a three pointer and the Cavs fouled Khris Middleton with 1.4 seconds left. Middleton made the first free throw to put the Bucks up by three, then missed the second intentionally. James desperation three was well off the mark and the Bucks held on for the win. Antetokounmpo had 27 points, 13 rebounds and eight assists to lead the Bucks. 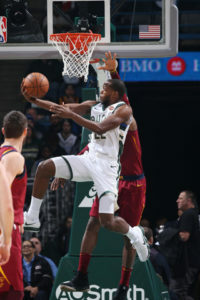 Erik Bledsoe added 26 points and Khris Middleton had 18 points and 10 assists. Malcolm Brogdon played 30 minutes off the bench and finished with 16 points, hitting 4-of-7 from three-point range. The Bucks (16-13) return to action on Friday night at the Bradley Center against the Charlotte Hornets (11-19). Since their last meeting on Nov. 1 at the Bradley Center, the Hornets have struggled, going 6-16.